Expression of the concrete frame. 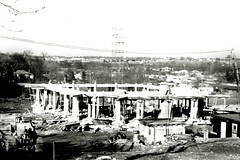 An image of the primary concrete structural frame in place taken during the project's construction. Its clear that the use of the free-standing, cast-in-place concrete columns was done as a rhetorical gesture. It relates the building clearly to structures such as Greek temples (post and lintel construction) as well as Gothic cathedrals (gargoyles directing water outward). This photograph brings to mind ruins of a Doric temple over a thousand years old. On closer inspection, the columns don't appear terribly classical. Their tapering form and paired organization makes it difficult to read them as directly classical in origin. In some ways, they appear to be the creation of the 20th century architect seeking to create his own order, along the lines of the Tuscan order or others which were developed later. I suspect Armstrong was seeking a kind of synthetic harmony between modern & traditional monolithic construction as well as Eastern & Western aesthetics. The combination of Eastern and Western aesthetics seems apparent from the primary forms which make up its silhouette: the curved, attenuated central steeple and the rectalinear, flat-roofed wings to each side of the central pavilion. The didactic nature of the concrete columns is emphasized in this image which presents the full square set of these columns. Other structure within the building tends to be suppressed in favor of surface treatments. Photograph courtesy of the Harris Armstrong Archives, Special Collections, Washington University in Saint Louis.